To finish out the week of instant tsukemono or pickles, here is a mixed vegetable pickle with the rather non-Japanese flavors of lemon juice and honey. Despite these flavors it does go pretty well with a Japanese meal, though you can drizzle a bit of soy sauce on top to make it more Japanese-y. It can be made in a batch, stored in the refrigerator, and eaten like salad until it's gone (though you should try to finish it within 3 or so days.) Using lemon as the acid is a nice change from the usual vinegar, as is the honey as the sweetener. I've called it 5-a-day pickles because that's the recommended number of fruit and vegetable servings you're supposed to eat every day, according to the UK National Health Service, but I often hear people complain that it's hard to eat that many servings. A good sized serving of these mild, salad-like pickles would do the trick in one go. I've used some winter vegetables since we're still at the tail end of winter (and it's been snowing hard here all week), but any vegetables in season can be used. You could use cauliflower florets, chard stalks, turnips, kohlrabi, celeriac, cabbage, etc. In summer I'm thinking of fresh cucumber, still-firm de-seeded tomatoes, green beans, peppers... Always blanch the tougher vegetables for a short time. Putting it in the marinade while still warm helps the vegetables to absorb the flavors better. I love the idea of a big bowl of this ready and waiting in the refrigerator, so at least the veggie part of dinner is done. Please replace the honey with another sweetener if you have special dietary needs. Combine the marinade ingredients in small pan. Stir over low heat until everything is dissolved. Take off the heat. Heat up a large pot of water. Slice the fennel bulb thinly. Peel and cut the carrots into matchsticks. Cut the broccoli into small florets, and peel and cut the stem part into matchsticks. Cut the celery stalk into matchsticks. Deseed and cut up the cucumber into...more matchsticks. Blanch the carrots and fennel in boiling water for 1 minute. Add the broccoli and boil for another 30 seconds. Don't overcook - they should still be very crispy! Drain well. Put the hot vegetables in the marinade and toss well. Add the celery and cucumber and toss some more. To serve, scoop out some and eat like a salad. If you've made the tsukemono seasoning mix, substitute 2 teaspoons of that for the salt, for added flavor. If you examine this recipe you'll realize that it's very much like European or American style pickle, except that there's no laborious canning and so on involved. In this day and age, unless you are dead set on only eating vegetables you've grown yourself or something and need to preserve your harvest for the winter months, there's not much incentive really to put up jars of pickled vegetables for long-term storage. There is an incentive to make things like jam and tomato sauce for the freezer, but these fresh pickles taste much better than ones that have been sitting around in a dark corner for months. Plus it assembles in minutes. That's been the main point of this week's recipes - to encourage people to re-discover the sour-sweet-salty pleasures of pickled vegetables, but without the fuss. Perhaps, like Manne, you'll be inspired to re-discover the pickles from your heritage. That's the last pickle recipe for now, though I'm sure I'll be posting more as other vegetables come into season. I hope you enjoyed them! Submitted by maki on 2007-03-23 20:26. Just wanted to thank you for all your postings on pickles. I made the 5-a-day, and I am hooked. Making the hakusai soon. Thanks also for the help regarding the konbu/dashi/MSG! I appreciate it. thanks for this healthy salad!more power to you! I made this recipe with vegetables in season [and in my kitchen] and I really liked it. I added mint leaves - which gave another hint of flavor, together with very hot hot peppers. Thanks for what seems like a tasty recipe, cant wait to try it out. I can't have carrots. Do you have a suggestion for a carrot substitute? Also, would bell peppers be something that could be compatible with this mixture? But these are NOT pickles; to 'pickle' a vegetable or fruit is 'to preserve' it. c.1440, probably from M.Du. pekel "pickle, brine," from a Low Ger. root of uncertain origin or meaning (cf. Du. pekel, E.Fris. päkel, Ger. pökel ). Originally a sauce served with meat or fowl; meaning "cucumber preserved in pickle" first recorded 1707. Figurative sense of "sorry plight" first recorded 1562. We Westerners have similar dishes to these, we preface the word pickle with 'refrigerator' or 'freezer' pickle in order to communicate that the veggies are NOT preserved. Not everyone is the brightest, and there's a lot of people wanting to learn to pickle. What if they were confused by your incorrect title and ate what they thought were preserved pickle? It's only petty if it doesn't matter. Food safety matters. PS: As far as your "this day and age" statement, I'm sure everyone prefers fresh, unprocessed produce. But some people like the comfort of knowing if they lost power for any reason, they still have safe food to feed their loved ones. I could be wrong, but I'm guessing you've never had to throw away entire fridge/freezer contents? I did refer to them as 'instant' pickles, and explained it in the first post of the series, which is linked to at the top of this post. In Japanese, long term and short term pickles (and both do exist) are both referred to by the same name, and for better or worse both have been translated into English as pickles (see Quick and Easy Tsukemono) which is why I continued to use that term. [quote=Windy]But these are NOT pickles; to 'pickle' a vegetable or fruit is 'to preserve' it. Wow, calm down crazy. If you don’t like her recipes don't eat them. She is literally just sharing a way she prepares vegetables. you make it sound like she's advocating food poisoning. Relax. A "serving" is a half-cup of most fruits/vegetables or a full cup of raw leafy vegetables. Is it reasonable to state that someone should really eat 2-1/2 cups of this in one sitting? Could you even eat that much? Since this is a bento site, I'm thinking you're good on portion control: 2-1/2 cups is a huge serving for any human, much more so for someone whose meals are typically 600-700ml in total volume. That would leave zero to 1/2 cup for grains/protein/other. (old comment but) It's like a salad, so you could eat quite a lot of this in one sitting, or divide it between two meals. 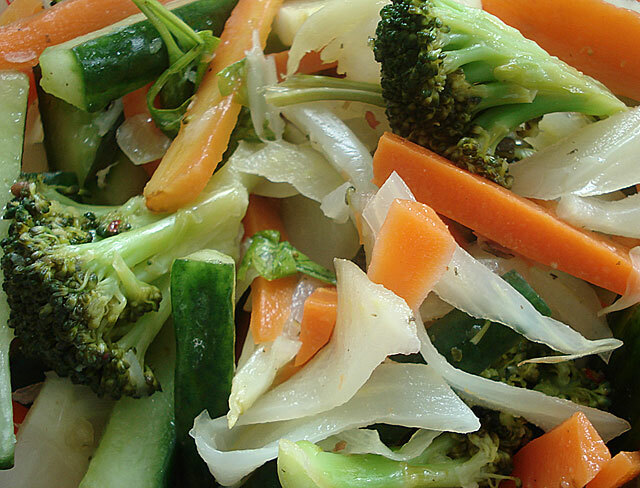 The idea behind this recipe is to make it easy for people to eat more vegetables. Studies show that most people barely eat a cup of vegetables a day. About to make these again because I loved them so much the first time. I'm just wondering about the whole peppercorns. That was the only thing that made these not-perfect for me before, because crunching through a whole peppercorn was a bit of a textural and flavoring challenge for me (they were softened up a lot by the marinating, but still). On the other hand, I'm not sure ground pepper would be as effective a flavoring. Do you usually eat the 'corns or pick them out before serving? (another old comment) - the whole peppercorns are meant to be picked out before serving' they are part of the marinade, but not to be eaten. You could but the flavor will be very different. I'm enjoying the site a lot but just wanted to point out that honey isn't vegan :) maybe you could write "or agave" or something? This recipe was posted way back in 2007; at the time I didn't tag the recipe under 'vegan but in a later round I must have for some reason. I've added a note about alternate sweeteners. Could you substitute regular mustard for the dry mustard?